Ted Clinite - One of the most improved golfers in our Seacoast Christian Golf Club, he has taken his hovering 9.0-10.0 index down to as low as 6.9 this past year. In fact, much of his improved play just took place in the past 5 months. Ted has been working diligently on his game, and it looks like he has found some secrets to his swing which enable him to constantly post low scores. Not only managing his skills on the golf course, he somehow also managed to heal up quickly after having his forearm stitched up after a visit to a nearby urgent care unit for a severe cut. Insider notes from his forecaddie disclosed that Ted almost had to withdraw from playoff contention this year, but somehow he found some secret homeopathic remedies and loaded up on Vitamin C, K, E, and D supplements which miraculously helped him healed quickly. But an additional secret report from the plastic surgeons office showed that it was simple "super glue" that did the job to close up the wound and nature took its place. Despite that fact that he was advised to lay off the clubs for 3 weeks, it was reported that Ted was back on the practice range after 5 days. Ted's game is very sound. He knows how to score and shoot low numbers. This year he is even more focused at winning the cup. He's been here before, and now he is hungrier than ever He has seen several opportunities at winning the cup slip out of his grasps over the years. This year he has a game plan and if he continues to play as he has been doing for the past 6 months, he'll be tough to beat. His key to win today is to play steady...post pars and birdies and not let the higher handicapper's stroke allotment be a factor. Ted has groomed his game this year to be ready for Match Play competition... and today he will show case all the hard work and preparation he has made this year in this Final match. Paul Deveau - has been also working on his game. He's considered the second most improved golfer in our golf league. He has taken his index from 17.4 to a respectable 14.2 this season. Driving his ball onto the fairway consistently has been one aspect of his game that has blossomed. Paul started playing with our group 3 years ago, and in 2013 lost in the early rounds of the playoffs. Then last year he improved his game, but then found an early exit ticket after battling Geoff Baynes in a a 'Wild Card" playoff round. This year he has been more focused. Almost playing in all of our scheduled events this year, Paul has kept his name at the top of our leader board for most of the year. His improved golf and course management skills has earned his way into the finals. In a quarter final playoff round against Curtis Chan, he came 1 putt away from loosing his bid for the 2015 Cup when Curtis failed to make a long putt for a win. This big win was a big morale booster for Paul...and ever since then he's been playing like a Champion. His last round in the "Semi Finals" against Lee Fitzgerald was not much of a test to his game, as Lee ended up showing up with a compromised swing as he was injured. 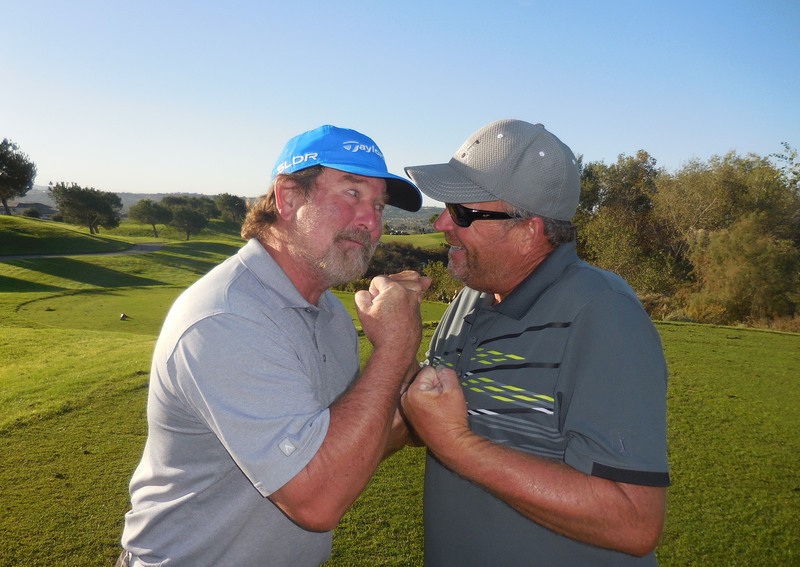 But today, Paul will have the competition of his life...Ted...the seasoned very improved golfer...against Paul Deveau, a golfer who wants to show he is worthy of the cup. Both will lay it on the line and will come down to: "who can play their best today"? ! Paul will get 8 stokes today and if he can hang on and make those strokes count for net birdies, he will certainly have a chance to put his name on the trophy today. This course at Arrowood GC is perfect for match play...with the tough back nine and finishing holes usually gives the higher handicapper the advantage. The lower handicapper is forced to play his very best to the end . This match will be a shootout and hopefully it will go all the way to #18. Due to injury, Lee Fitzgerald had to withdraw from the competition and graciously let Kevin Barrett know how sorry he was for not being able to compete in the consolation match. Kevin Barrett along with the tournament committee wish Lee all the best in his recovery and healing so that he will be ready for next season. Kevin will finish this year as a 3rd Place Winner. 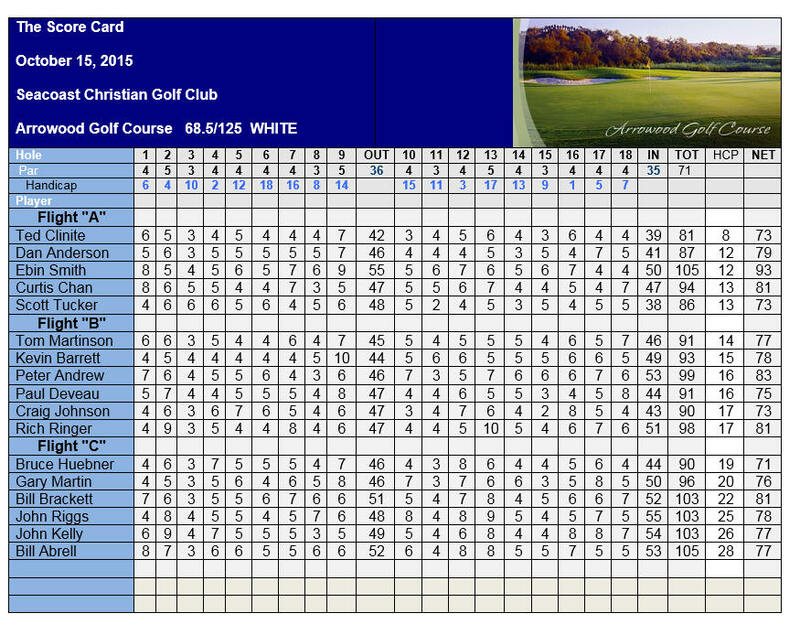 Our low net winner is: Bruce Huebner who posted a low net 67.
note: the accounts of this match was recorded and re transcribed for your viewing pleasure. There is no claim by the hired reporter of the accuracy nor the emotional accounts and true thoughts of the players. The reporter has reassured the tournament committee that the written account is what actually took place to the best of his knowledge and what he witnessed. Hole #2: But then on the lengthy par 5, Paul faded his drive towards the large and deep fairway bunker to find himself just barely missing the bunker, yet buried in grass on a steep slope. Ted had a confidence drive that found the middle of the fairway. Paul struggled and sprayed his 2nd shot into the left fairway bunker and proceeded to expend several more shots to save double bogey, while Ted calmly got up and down and tapped out for par. The All Square Match, now put Ted back into the driver seat. Hole #4: Both players now faced the very treacherous and difficult handicap #2 Fourth Hole. Ted missed hit his drive /or the wind somehow knocked it down and it settled short of the fairway bunker. Paul hit a long drive that sailed right just off the fairway. 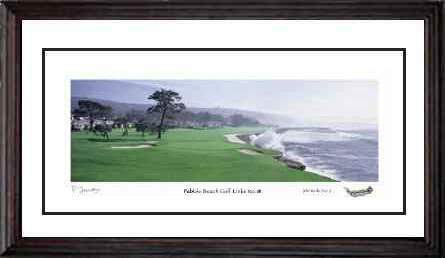 Knowing that he had a stroke on Ted, Paul took a chance and hit a low shot that rolled right onto the green just 15 feet from the cup. Ted, realizing how important it was to win this hole, pulled out some magic and put his approach shot 20 feet from the cup. Now it came down to the putts. Ted two putted for a par, but Paul returned the favor and followed suit to par the hole too, but with his stoke he wrote down a net 3 for the score card and took the match to ALL SQUARE. Post Match Interview : After the round, both players were willing to take photos and field questions about the match. Paul said "Today was my chance to win the trophy...but I couldn't get the job done. Ted played well as is his norm..he doesn't make too many mistakes..but he opened a few doors today...in fact at least 3 times..but I only took advantage of one opportunity which helped me win a hole. All the other times, like on #9 when he went into the hazard and took a double, I blew it and took an 8. Then on #12, I had a stroke plus an opportunity to win a hole when he made a bogey...yet I doubled..and there you go...missed opportunities. But I have to say if I had to loose a match...I would gladly loose to a nice guy and golfer who played well. Today was Ted's day and I'm happy for him. 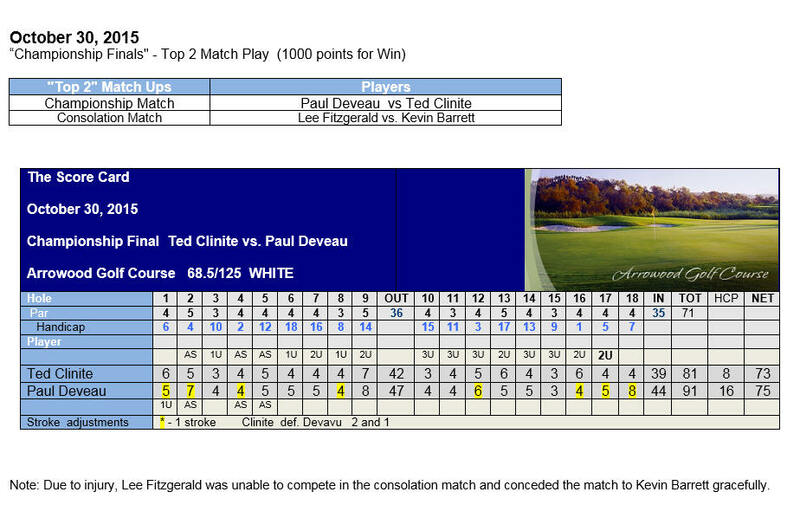 Ted has been stellar all golf season and he truly earned his way to the cup. I'll retool and be ready for next year ." After filtering through the media and photographers we were able to sit down with Ted to discuss his achievement. Ted said.." I am really happy that I finally won the cup. For the past 3 years I've made my way into the playoffs, but someone would have a great match play day and knock me out. This year I focused on playing more consistent and striking skills. It really paid off as I've been posting really decent rounds and my index reflect all the hard work I've put into my game. Today Paul truly gave it a run. I can recall a couple of holes where I went into the hazard and still ended up winning the hole..I think on #9. Then I make a great chip shot on #10 for the tap in birdie. Somehow I made a bombing drive that rolled almost all the way to the green. When I got the 3up lead I felt in control of the match. But then on #16 when Paul seemingly lost his tee shot, but found it and then proceeded to save par....wow..I got a little worried and some thoughts came back to me with memories of past playoffs where I lost the match..and I said...'Here we go again'....but I settled in on #17 and was able to finish the match. It was just those few holes that got me to this result. Paul is a good friend and I hope he continues to improve his game so that next year he'll have another crack at the Cup. I'm now going to be part of this elite group of Seacoast Cup Champions who have earned this special trophy and I'm going to do my best to defend it next year." 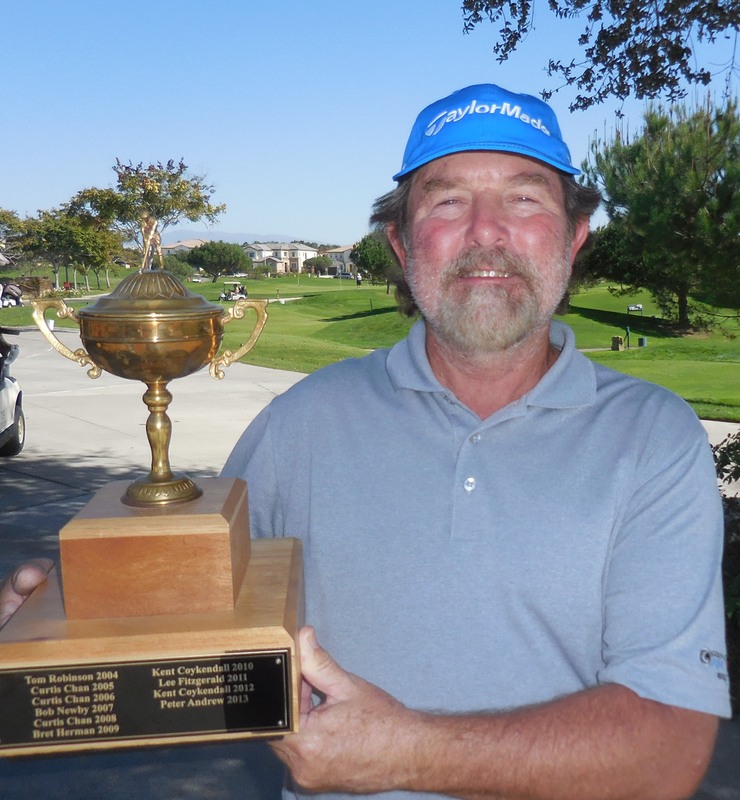 Congratulations to Craig Johnson for having a strong second half of the golf season and playing steady in the Player's Cup division to earn enough points to maintain the lead and win the 2015 Player's Cup trophy. Craig Johnson lost early in our playoff season by taking a loss to Ryan Alexander back in September in the Wild Card -top 16. But after that, Craig never looked back and in fact was never defeated in the Player's Cup division. He proved he has game and racked up enough points to overcome several players who were trying to chase him down. Bill Abrell (age 90) came close as he kept showing up to our events and although he plays from the "forward" tees, he has proven to all of us if you keep on showing up and playing "The Game"...you might be able to "Shoot your Age"....Bill is a great example of this !! Congratulations to Craig for Winning the 2015 Players Cup division. And a congrats to Bill Abrell for coming in second. After all the points were allocated to winners, here below are the final standing. This is our formerly "Breakfast of Champions" event but has been re titled as " Lunch of Champions Awards / Prizes" where we present the winning trophy to our new winner - Ted Clinite 2015 Seacoast Cup Champion. We will also honor and award trophies to several of our winners . Also raffle prizes from New Adams Drivers to Putters, Golf Apparel , Free Rounds of Golf , will be available to win for those who show up.